Dentures and partials are removable dental prosthetics that can easily and affordably be used if you’re missing some or all of your teeth. 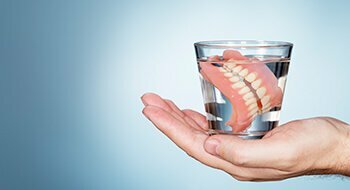 Dentures can be held in place by natural suction or dental implants, giving you plenty of options. Partial dentures are held in place by clasping onto remaining teeth. Why should you make sure to replace missing teeth? If you’re missing your entire set of top or bottom teeth, you’ll need tooth replacement to make it possible for you to eat properly again. Without teeth, you can’t get the various nutrients a body needs to maintain optimal health. However, even just one missing tooth can be a big problem, leading to increased risk of oral health problems and further tooth loss. You may not be sure about which form of tooth replacement will work best for you, but that’s okay; we can guide you through information about each option and perform an examination to help you navigate your choices. Contact Cosmetic and Family Dentistry of Weatherford, convenient to patients from Aledo, Brock, Millsap, Mineral Wells, Springtown, and beyond, to make an appointment with Dr. Romack or Dr. Mulkey.